The XVII International Conference on Electrical Bioimpedance (ICEBI) is the most important platform for presenting recent scientific achievements in the area of electrical bioimpedance. The conference starts on 9th of June 2019 with workshop presented by companies related to the impedance measurement business. From 10 to 13th of June 2019, over 300 papers are expected to be presented in the conference in either oral or poster format. Full papers will be published in the IFMBE proceedings book. Extended papers will be invited to the special issue of Physiological Measurement journal, which will be published in February 2020. 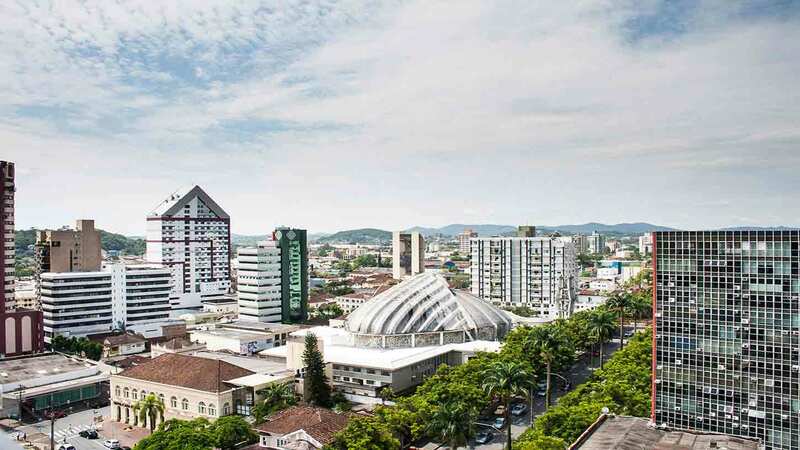 The ICEBI 2019 will be held in Joinville (Brazil) at Bourbon Business Hotel. It is planned to have 4 mini-courses and 6 tutorials or invited lectures, covering relevant and indispensable topics for starting and getting a deep understanding on electrical bioimpedance. The ICEBI 2019 will have a “Live Demonstration of Bioimpedance Technologies” (OLBIT) track to allow an interactive and tangible form of presentation, which is quite different from the oral or poster sessions. Colonized by Germans, Swiss and Norwegians, Joinville preserves with affection its origins in the architecture, culture, typical gastronomy and vocation for work and development. The largest city and industrial region in Santa Catarina, it is also one of the main touristic destinations of Santa Catarina, offering options which range from excursions to points of historical interest, as the Museu Nacional de Imigração (National Immigration Museum), to some of the largest cultural events in the country, for example the Dance Festival. Dance is indeed an icon of Joinville. The city is proud to house the only branch of the Moscow Bolshoi Theatre. With an excellent infrastructure of hoteliery, trade and services, Joinville is a reference in events tourism, also standing out in activities linked to nature and rural life, which you can note in trips to Serra Dona Francisca (Dona Francisco Mountain Range), Estrada Bonita (Beautiful Road) and the regions of Piraí and Vale do Quiriri (Quiriri Valley). No cars available for this event! By submitting partial or full payment, I'm agreeing to the cancelation policy, general terms and conditions for amendments. - Cancellations received 30 days before the check-in date (entrance to the hotel) will result in a 10% penalty of the total amount of the hotel package. - Cancellations received between 29 and 10 days before the check-in date (entrance to the hotel) will result in a penalty of 20% penalty of the total amount of the hotel package. - Cancellations received in writing less than 10 days before the check-in date (entrance to the hotel) will result in a 100% penalty, in other words, the total amount will not be refunded. - Changes in dates and room types are subject to hotel availability and rate variation. After sending your request will be sent to your email address registered a bank invoice for payment of the contracted services. Please note, this form of payment is only for Brazilian Citizen. Enjoying a central location in downtown Joinville, Bourbon Joinville Business Hotel offers stylish 4-star accommodation with a business centre, 24-hour room service and private parking.The modern, air conditioned rooms are well-appointed with work desks, cable TV and free Wi-Fi. Bathrooms are equipped with a shower.Guests of Bourbon Joinville can dine in the hotel restaurant, or enjoy light snacks and refreshments from the café or bar. Alternatively, restaurants, bars and shops can be found in close proximity to the hotel. A daily breakfast is offered free of charge. This property also has one of the best-rated locations in Joinville! Guests are happier about it compared to other properties in the area. Located in Joinville city centre, this hotel offers air-conditioned rooms with free Wi-Fi and free parking. An outdoor pool, gym, restaurant and bar, plus a 24-hour-reception are available.Rooms at Hotel Tannenhof provide cable TV, radio, telephone and minibar. The private bathroom includes a shower.The mall Shopping Mueller is only 200 m away. Joinville bus station is 2 km from this property, and Joinville airport is 15 km from Hotel Tannenhof. Blue Tree Towers is located in the city centre of Joinville. It features a modern gym and sauna. Free WiFi is offered throughout the property.Rooms at Blue Tree Towers Joinville are air conditioned and include a spacious work desk, a minibar and a 32” cable TV and digital safe. Some superior categories offer a spa bath. They are all are served by a 24-hour room service.This Blue Tree Towers hotel serves a daily buffet breakfast at its award-winning restaurant. Guests can enjoy refreshing drinks at the lobby bar. The 5-star Mercure Prinz Joinville invites you to enjoy its spacious rooms in downtown Joinville, only some meters from the Mueller and Cidade das Flores malls.Upon being welcomed by the accommodating staff, admire the décor of the lobby and make yourself comfortable in your spacious, air-conditioned room.During your stay at the Mercure Prinz Joinville, you can surf the net, enjoy the outdoor pool, relax in the sauna and work out in the well-equipped gym for free.The hotel also offers a varied menu of international cuisine in the restaurant, as well as several large rooms for business meetings and other purposes. Located 300 metres from Shopping Mueller Joinville in Joinville, Ibis Joinville welcomes guests with a restaurant and bar.All rooms at Ibis feature a minibar and a private bathroom with a shower.You will find a 24-hour front desk at the property.Joinville Arena is 2.3 km from Ibis Joinville, while Ernestão Stadium is 2 km from the property. Lauro Carneiro de Loyola Airport is 10 km away. The tour departures from the hotel and starts at the Museu da Imigração (Museum of Immigration), Rua das Palmeiras, panoramic views at Praça dos Imigrantes (Immigrants Square), at Praça das Barcas, City Hall , Cau Hansen Event Center and Bolshoi Theater School, University and Industrial Area. Visit to Hemerocallis Park, with guided tour through the flower production, gardens, and the chapel. Visit to the traditional rural producers of “cucas” (traditional cake of the region), homemade breads, molasses, mousses, biscuits and handicrafts. Also a panoramic walk to the Ponte Coberta (Covered Bridge) where pictures from the waterfall can be taken. Visit to the Expoville Park, a great place to get souvenirs from Joinville. 2- Does not include meals. São Francisco do Sul is the third oldest city in Brazil. In the Historical Center there are more than 400 restored buildings listed by the National Historical Heritage. Natural attractions include Babitonga Bay, many beaches such as Enseada, Prainha, Praia Grande, Forte, Capri, and Paulas, each of them with its own distinctive grace and attractions. Departure from Joinville at 6:00am - in order to board the tourist train at the Bus and Train Terminal. Transport will be available upon arrival in Morretes at approximately 12 o’clock (noon). Our suggestion for lunch is Barreado - a typical dish from the region. After lunch transport will take you back to Joinville driving along Paraná State’s coastline. The tour takes 1 day and meals are not included. Joinville stands out as a milestone in the integration between the primary and tertiary sectors of the economy with the presentation of our itineraries of industrial tourism, an activity that has been improving in an extraordinary way in the tourist activity. The largest multi-sector industrial condominium in the State. It accounts for 2.65% of Santa Catarina's gross domestic product (GDP). It was opened in 2001 and it accommodates more than 150 multi-national companies from Brazil, Italy, USA, Germany, Switzerland, and other countries. 1- Duration - 3h - from 9AM to 12PM, or from 2PM to 5PM. 2- Meals are not included. 3 – Booking must be done at least 5 days prior to tour date, so the companies can manage their agenda. 4 -Groups of minimum 5 people.